Step 1. Using an electric mixer, beat butter, rind and sugar until light and fluffy. Add egg yolks and peel, beat until combined. On low speed, gradually beat in combined sifted flours until mixture comes together. Form into a disc, wrap in plastic wrap and refrigerate for 30 minutes. Step 2. Preheat oven to 180C. 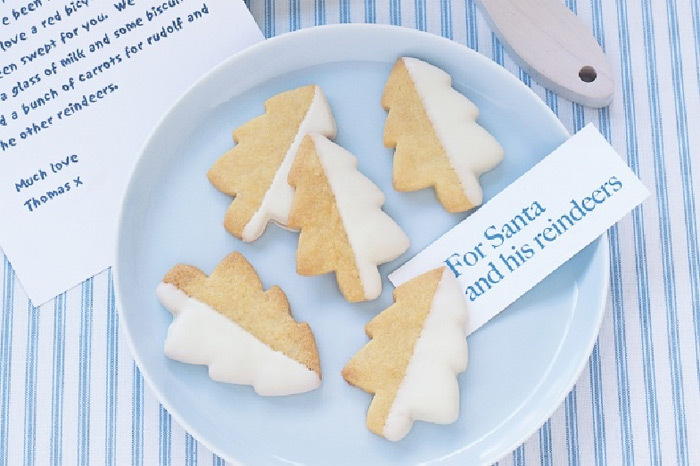 Roll out dough between 2 sheets of lightly-floured baking paper until 3mm thick then, using a 7.5cm Christmas tree-shaped cutter (or cutter of your choice), cut out shapes and place on baking paper-lined oven trays. Repeat, rolling dough scraps until all the dough is used. Refrigerate dough on oven trays for 30 minutes, then bake for 8 minutes or until lightly browned. Cool biscuits on trays. Step 3. Half dip biscuits in melted chocolate, place on baking paper-lined trays and stand until set. Biscuits will keep in an airtight container for up to 2 weeks.